Let’s be honest, when traveling by air or driving it’s hard to be productive and it’s stressful. Yes, one can make phone calls while driving, but I don’t recommend it. When traveling by air, you can work in the airport lounge while waiting for your flight, but that is about it. Unless you are in first class or business class, you have very little room to work if any at all. However, they are some transportation modes where you can be productive while you are in transit. There’s the train, and they are buses. I’m not talking about subway trains or the number 63 bus to downtown. 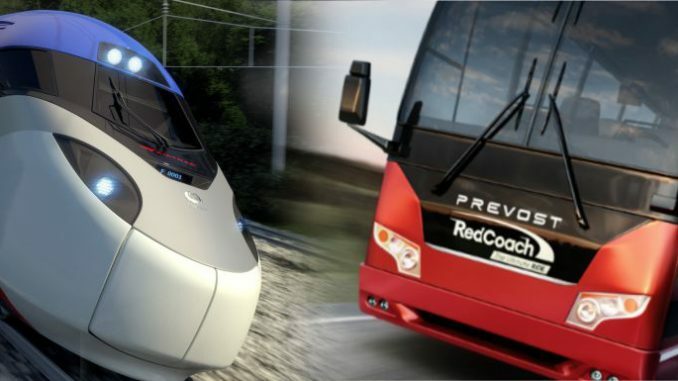 I’m talking about long-distance trains and first class intercity bus services. Granted, taking an Amtrak train is a slower means of travel than taken a plane. So you need to be smart about your choices. I wouldn’t take a business trip on the train from the East Coast to the West Coast of the US. That trip takes three days. However, for traveling 750 miles or less, it’s a good alternative to both driving and flying. It’s comfortable, you have more room to get out your laptop, and you’re in one place for a while. But don’t book a trip where you have to change trains as it will cost you more in time. All North American intercity trains have power outlets where you can plug in small electronics devices such as a laptop computer. Also, most of them have Internet access, but it’s G3 speeds at best. If you need access to the Internet, then I recommend tethering your phone or using a personal hotspot device. Still when you between cities in the middle of nowhere, don’t be surprised if these devices don’t work. Another huge advantage to traveling by train while working is that you can get up any time you want. You can get up for a cup of coffee, buy food, use the bathroom or to just stretch your legs. It’s almost like working in an office except you’re moving. 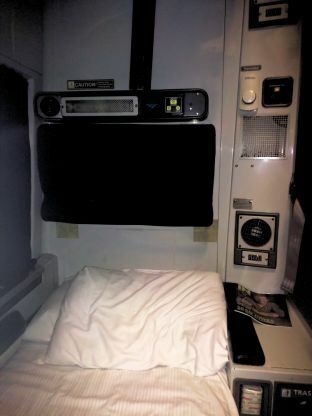 If your train trip includes traveling overnight, then I recommend buying onboard sleeping accommodations. Amtrak offers Roomette and Bedroom accommodations. These sleeping accommodations give you a private room during the day to work and make telephone calls. Also, they are much quieter than standard train carriages. Sleeping accommodations on the train are little more expensive than hotel rooms. However, on most trains, meals are included with sleeping car accommodations helping to offset the cost at expense time. In the evening the sleeper car attendant will set up your bed. They usually do this while you’re in the dining car eating dinner. So you’ll want to put your electronics away first. In the morning, the sleeper car attendant will convert your room back into a day room. Amtrak sleeper car accommodations also include free bottled water, coffee, and orange juice in addition to meals. New intercity bus services are starting to crop up in many states with the business traveler in mind. Admittedly, most of these are on the East Coast and some are in Florida, Texas, and California. I’m sure we will see more to come over the next few years. These bus services are a great alternative to driving trips of five hours or less. You won’t see fares as low as $1 as you do with Megabus or BoltBus. But, you will have plenty of leg room, a small table, power outlets and internet access. But more importantly, an environment conducive to working while in transit. Last month while I was in Florida, I traveled on the Red Coach from Orland to Miami Florida for $48. The trip took about four hours. I had a wide leather seat, a small table, and a power outlet. I had plenty of room to get out my laptop and work during the trip. Also, they have a small lavatory at the back of the bus about the size of an airplane bathroom. Before boarding the bus, the bus driver verified I had a ticket. Then he took my suitcase and placed it in the luggage hold underneath. The only thing I carried on was my backpack with my laptop inside and a couple of bottles of water. The trip was very smooth and as with my train trip, I was able to get plenty of work finished. A Bus company that’s on my bucket list to try is Vonlane in Texas. Vonlane’s tagline is “Private Jet on Wheels” and they mean it. They are the best bus service I’ve come across so far who cater to the business traveler. Like Red Coach, they offer wide leather seating, power outlets at each seat and onboard internet access. But they differentiate themselves by providing and an onboard attendant, refreshments, snacks and meals on select trips, a closet where the attendance hangs your jackets, noise canceling headphones, satellite radio and television and a closed door conference room. These guys have your productivity in mind. Vonlane travels between three cities in Texas: Dallas, Austin, and Houston. The one-way fare at the time of this writing between Dallas and Houston is $99. Private Jet on Wheels – Vonlane Bus Service Update: I have since ridden on Vonlane and posted an article about My Stress-Free Work Trip on Vonlane. Unlike airports, most train and bus stations don’t have Taxi’s to get you your final destination. That’s where Uber comes into play. As anyone who’s used Uber already knows, there usually only 4 to 5 minutes away. But you do want to check to see if Uber offers service at your destination before the trip. Another alternative is Enterprise car rental. Enterprise car rental has several locations in most cities. As long as you have a reservation close to where you got off the train or bus, they will pick you up. When possible, I like to use these alternative transportation services when traveling for work. They are two things I didn’t expect using these services. The first is how quickly these trips go when I’m busy working. The second is how much more relaxing they are compared to air and car travel. When arriving at my final destination. I’m relaxed and more alert ready to take on the day. Please feel free to share your alternative travel tips and tricks here by leaving a comment.